ACA has released Newsletter Bulletin, Volume 12 for our affiliate network. Back in December, I shared some of the exciting opportunities shaping up for 2019, one of which was managed care. While it’s still early in the timeline, the people you support and their families may already have questions about this sensitive topic. You will continue to serve as a critical source of truth to them during these confusing times and we want to make sure you have the background you need to take on this responsibility. The first thing to keep in mind is that only NYS Medicaid-funded services are impacted by this transition to managed care. If a person has Medicare or commercial insurance through family or work, those services remain unchanged and unimpacted. In those cases, only the HCBS waiver services a person receives (e.g. residential, habilitation, supported employment, self-direction, etc.) will transition into managed care. If someone gets "State Plan services” (e.g. medical/hospital, behavioral health, dental, pharmacy, etc.) through NYS Medicaid, then those services will also move into managed care under an integrated insurance plan. Depending on a person’s circumstances, different services are subject to the managed care transition. This has been and will continue to be a major source of confusion to families—and it’s something you can help clear up quickly when asked. This spring, the “early adopters” will announce limited insurance plans covering Medicaid State Plan services (i.e. the non-waiver services/benefits a person may receive). Enrollment in these plans will be on a purely voluntary basis. The expectation is that these plans will eventually also cover waiver services, but there will initially be limited information available. Following the “early adopters,” the state will approve “SIPs-PL” (Specialized I/DD Plans—Provider Led) sometime in late 2019 or early 2020. These plans will cover all the NYS Medicaid-funded services someone with I/DD might receive. If family members want to be in the same plan as their loved one, they are eligible for enrollment as well. ACA and its CCO partners upstate are applying to offer such a plan and we look forward to sharing more news on this over the coming months. Enrollment in these plans will initially be voluntary but, based on OPWDD’s current timeline, it will become mandatory by 2021. People will be able to move around/change plans at all times and OPWDD expects to see a choice of plans before making enrollment mandatory. By 2020, everyone will have much more information on the various options and will be able to make an informed choice for themselves or their loved ones. When choosing a managed care plan, it pays to consider all the options and ACA is working to deliver a solution that meets the needs of the people we support and their families. Stay tuned! I hope 2019 is off to a great start for the extended ACANY family! Back in December, I wrote to you about some exciting changes that are coming, including the introduction of managed care and our overall growth as an organization. I’ll come back to these two in the weeks ahead. 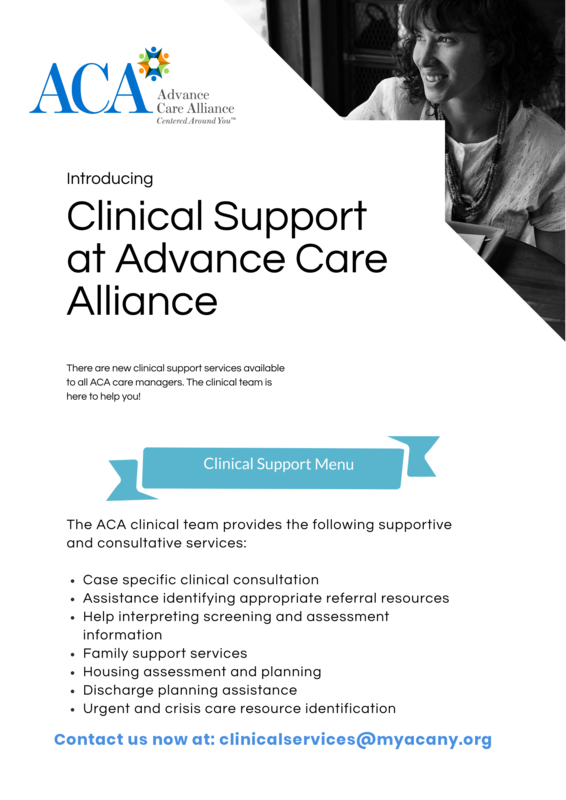 For my first message of 2019, I want to share about the work of the new ACANY clinical support services team—a resource that we hope will become more familiar and accessible to you over time. Though still growing, this new team is already making an impact. In a recent consult, they were able to help a Care Manager drill into the supports that a person needed and help connect the family with the right resources before they had to make an extreme choice. The situation was particularly challenging: the family of a young woman enrolled in ACANY wanted her to be admitted for acute psychiatric care because “she was acting out.” Many of you, if not all, have probably supported people in similar circumstances. While sometimes a person truly needs inpatient care, it is rarely the first course of action and should only be pursued once all layers of the onion have been peeled back to get at what is really happening. In this case, the family had just gotten a new puppy over the holidays. This was when the young woman’s “behavior” started to become unbearable for her family. Oftentimes, what we think is the cause of the “problem” is not actually the root cause, but just another symptom. The clinical team was able to identify this and bring in NYSTART and a respite provider. As the saying goes, “all behavior is communication.” Having partners who can help fully evaluate the situation and bring in the right resources will help ACANY deliver better supports to the people we serve. This will put us in great shape for the future under managed care. ACA has released Newsletter Bulletin, Volume 10 for our affiliate network. When someone is speaking to you, how often does your mind start to wander? Maybe you check something on your phone. Maybe something catches your eye. Maybe you start worrying about a challenge you’re facing. How often has it happened on a phone call? In a meeting? In front of a family and/or person supported by ACANY? In front of someone else important to you in your life? In the past bulletins, we've shared many ideas about the values and the philosophy we’re instilling in the culture of ACANY. At a more essential level, providing Care Management in an individualized/person-centered way starts with the basics: listening and practicing being present. This point is illustrated well in the video above from Open Future Learning. In order to fully assess the supports a person and their family need and to develop a meaningful plan, we need to begin by listening carefully to their story and what they have to say. We must listen actively and appreciatively. This is a constant struggle for all of us. We all need to challenge ourselves to do better—to be even more present and purposeful in everything we do. Newsletter Bulletin, Volume 9: Why do we provide Care Management? ACA has released Newsletter Bulletin, Volume 9 for our affiliate network. Keeping Perspective: Why do we provide Care Management? Why do we do what we do in this field? What is the purpose of it all? The work requires a lot of us as people, so what drives us to invest ourselves in our jobs? These are provocative questions with many answers. I choose to answer them from the perspective of the people we support and their families: we do it to ensure that people have what they need to enjoy the lives they choose—and the lives they deserve! If the roles were reversed, we would want nothing less for ourselves and our loved ones. This reflects a principle that many of us were taught growing up: “Do unto others as you would have them do unto you.” The brief video above from Open Future Learning reinforces the idea with their typical humor. The process of building a Life Plan for someone involves assessing needs, coordinating services, and then ensuring they’re delivered in a high-quality and timely manner. But are “services” really what someone experiencing a disability wants? Are they simply customers shopping for a product? The answer, of course, is a resounding “NO!” The services, supports, and programs are a means and not an end. In every role within ACA, we should internalize, embrace, and keep this message top-of-mind. Yes, when someone calls to enroll in a program, they are literally asking for services. However, we should view these services in the larger context of helping people achieve the same things we all want in life. If someone calls their Care Manager to change the plan or find a new program, we shouldn’t just start processing the paperwork. We should take the time to ask why and assess the best course of action based on what they say. When we are auditing notes and records in Quality Assurance, we are not merely doing it to keep ACA in compliance—we are ensuring that documentation is accurate so we can be certain that people are actually getting what they need. We use labels like “enrollee” and “employee” to differentiate roles, but all of us are part of a community with one common mission: to help people lead more enriching lives. ACA has released Newsletter Bulletin, Volume 8 for our affiliate network. The language that we use drives so much of how we think and behave. Without a doubt, anyone with even modest experience in this field has lived through several changes in the words we use to describe what we do and whom we do it for.Though it may seem small, having a common language and frame of reference will be critical as we come together as one ACANY. The above illustration from Open Future Learning has two primary takeaways: the people we support do not belong to us and they don't deserve to be labeled as anything but "people” or preferably their own name. At its base, our treatment of people reflects how we think about them. Ingrained behaviors like language don’t change overnight, but when we train ourselves to be intentional in how we speak and think, our work becomes more person-centered as a result. Here’s a brief video from Open Future Learning that illustrates the same theme. Let’s all recommit to be more precise with the words we choose and to reflect on what they imply about our beliefs and attitudes. An easy way to do this is to reverse the situation: how you would feel if someone referred to you in the same way? If you wouldn’t like it very much, don’t assume their reaction would be any different. Newsletter Bulletin, Volume 7: What does it mean to be ‘Person Centered’? ACA has released Newsletter Bulletin, Volume 7 for our affiliate network. What does it mean to be "Person Centered"? “Person centered” is a phrase that has become so frequently used in our field that its exact meaning is not always immediately clear. Over the coming weeks and months, ACA will sharpen our collective definition of what it means to be “person centered” by working together to support our community. In the meantime, I want to share a brief video by Beth Mount that outlines some ideas for us to consider. A key theme in the video is the contrast between system-centered and person-centered ways of thinking and planning. System-centered thinking is very much rooted in the “medical model,” which was repudiated with the closing of the state schools and the shift toward greater community integration. That framework focuses on someone’s deficiencies and aims to “fix” them. Too many in our field still think this way. While the status quo does an okay job for many people with I/DD, we can do better for all the people and families we serve. We have the potential to accelerate this shift in thinking and practice, under conflict-free Care Management. Our starting point should always be a person's capacities. This is followed by an assessment of their community and natural supports, tied together with their life goals and dreams. When this becomes the experience for everyone enrolled in ACA, we will have achieved success. ACA has released Newsletter Bulletin, Volume 6 for our affiliate network. In addition to practical information like announcements and advisories, we want to use this space to share stories and ideas as part of building a common language and framework for Care Management across ACANY. In the short video above, David Pitonyak quotes Beth Mount: "Loneliness is the only real disability.” In fact, loneliness is increasingly being recognized as a public health hazard, especially among the elderly. The factors that contribute to loneliness among the elderly are similar for people who experience disabilities. The need for us to "do better" is compelling in both cases. Do you remember the last time you asked someone you support about their friends and other relationships? Was it at their last planning meeting, or is it something you talk about on a regular basis? How many times does their ISP/Life Plan mention relationships? One of the most provocative ideas in the video is that all the work we do–all the supports you coordinate for people–should be focused on developing meaningful and enduring relationships. Ensuring material needs like food and a home of one's own is important, but having people you can trust and cherish is the difference between having a life and just living. ACA has released Newsletter Bulletin, Volume 5 for our affiliate network. We are now six weeks in and CCO Care Management is a work in progress that is steadily advancing every day. As of the second week of August, over 70% of affiliated agencies have received at least one payment for the services rendered in July. Under MSC, this would have only been reimbursed in late August/early September. Almost every organization has documented activities in MediSked and training events have been very well-attended by a highly engaged and committed Care Management workforce. On top of these extremely positive signs, there remain significant hurdles. Many are without CHOICES access, impacting the ability to conduct intake or update DDP2s and other OPWDD records. MediSked faces issues with basic functionality and critical reporting features are not yet available to our affiliates due to security requirements. Perhaps even more challenging is the fluid movement of members between tiers each month, with those designated as Tier 4 facing the potential of an unwanted change in Care Manager due to the caseload cap—even if they are not part of the Willowbrook class. Despite these challenges, the 7 CCOs are united and are actively coordinating to get these issues resolved expeditiously. While the positive aspects are encouraging, we will not rest until these challenges are overcome. Each hurdle is a test of the resiliency of this new coordination model and the people whose hard work is bringing it to life.We are humbled by the responsibility NYS has placed on us to lead the way, identify solutions, and advocate for our affiliates and the 25,000+ people looking to us for support. As always, we thank you for your partnership in this enormous undertaking. ACA has released Newsletter Bulletin, Volume 4 for our affiliate network. Thousands of activities were logged in MediSked and ACA has been billing claims on a weekly basis. More importantly, the State has been paying claims about 10 days after submission. The first checks from ACA are on their way to providers at this very moment. Hundreds of Care Managers participated in the ACA webinar training earlier this month. We're constantly exploring ways to connect such a vast, dispersed team. Stay tuned for more on that over the coming weeks. As of today, ACA employs almost 50 full-time staff members (48, to be exact). It's hard to believe we began this undertaking less than a year ago, with only one person on staff until April 2018. By this time next year, we will number around 1,000! Thank you for your continued partnership and patience. Nothing as important as the work we do changes overnight and each of us plays a crucial role in ensuring the long-term success and sustainability of this transition.